White blood cells & platelets. Coloured scanning electron micrograph (SEM) of a group of white blood cells (leucocytes) and activated platelets in human blood. 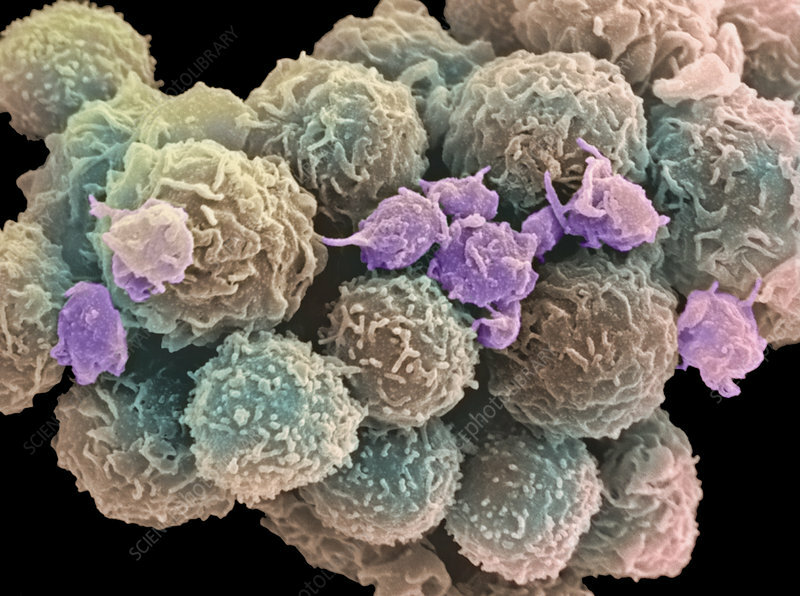 The larger rounded white blood cells (coloured brown) play a role in the immune response of the body. At centre and far left are smaller platelets (thrombocytes, coloured purple). Platelets are non-nucleated cells found in large numbers in the blood. When inactive they are round or oval discs; activated they have dendritic processes, or pseudopodia (as seen here), and they may become star-shaped. When activated, platelets clump together and are involved in blood clotting. Magnification: unknown.